In order to cut time and costs in your warehouse and distribution center operation, establishing best practices is key. We’ve picked the brains of our own supply chain engineers on ways to improve warehouse and distribution center efficiency, and ultimately drive down costs. Here are eleven tried and true best practices to improve warehouse and distribution efficiency. 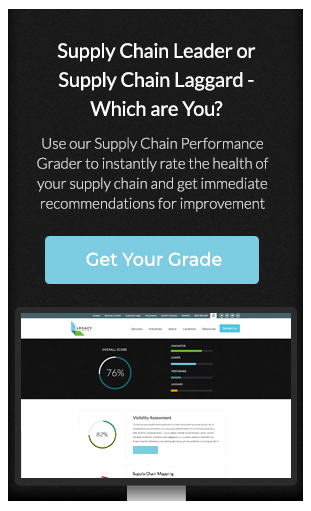 Having a vendor compliance program is an incredibly effective way to enhance the strategic relationship between a business, its vendors and 3PL providers. Common results from well thought out compliance programs include streamlined warehouse operations, reduced handling of products, improved transportation service times and ultimately increased customer satisfaction. Integrating common product identification and tracking processes all the way upstream to offshore or domestic vendors will help ensure proper visibility and seamless movement of product through the supply chain. Using clear and specific labeling requirements and standard case quantities for each shipment and individual item can go a long way to making warehouse and distribution center operations more efficient. As with many optimization steps, small efficiencies add up over time making a huge difference on the bottom line. Note: businesses that run their supply chains the right way incent the parties involved to contribute toward a more efficient supply chain, not simply punish them for non-compliance. This may seem like a no-brainer, but many distribution centers still have not implemented electronically transmitted advanced shipping notifications (ASN). Relying on a “regular” shipping & receiving schedule can result in inefficiency throughout the distribution center. Delays happen, disruption happens- and it causes deviation from the “regular” schedule. The resulting issues start with improper staffing at the receiving dock and ripple through the warehouse. However, by leveraging electronic advanced shipping notifications within the purchase order and inventory management functions, labor can be planned with more certainty. Order fulfillment and transportation activities can be adjusted to ensure proper service time requirements are met, and transport modes are optimized to keep costs down. Going even beyond handheld scanners, newer technologies such as wrist-mounted RF units, voice pick, pick- or put-to-light order fulfillment systems further accelerate the picking process. Future technologies are being developed with wearable devices such as Google Glass that are making the tracking aspect more and more intuitive to the picking and order selection process. Instead of sending pickers on the basis of order sequence, Tier 1 Warehouse Management Systems (WMS) provide technology that can plan out picking waves in the most efficient routes. This streamlines the picking process and results in not only faster turnaround times for orders, but also a more efficient use of labor and manpower. Any movement or step in the process that cannot be tracked or recorded as a transaction either is an unnecessary step that should be eliminated, or it is a step that should be added to “fix it” list. When things come up that are not part of the process, this is referred to as a “turnback” and should be reported (see our previous post about reporting turnbacks as a crucial part of warehouse optimization process). Picking directly to a shipping carton instead of an intermediate bin or tote is just one example of eliminating unnecessary steps in the distribution center process. When superfluous steps are eliminated, the process becomes faster and more streamlined, customer relations soar, and bottom lines improve. 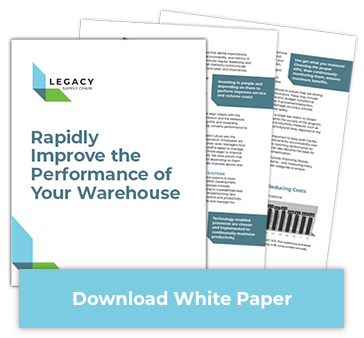 Looking at ways to improve your warehouse systems is a very important step to cutting costs in your distribution center. For warehouses that have multiple dock setups, there is an opportunity to streamline offloading labor by scheduling shipments to arrive simultaneously. This prevents separate setup and breakdowns at loading docks and consolidates the labor and time necessary to load and unload shipments. Working with vendors to ensure that deliveries can be scheduled precisely, and establishing clear metrics and a high performance culture all contribute to an expectation of timeliness that results in overall increased efficiency. Another way to cut time and costs substantially is implementing an ongoing cycle count program in lieu of a regular full physical inventory, which could halt operations or cause a large disruption in your warehouse. Having an ongoing cycle count program that samples various subsets of inventory is a more efficient way to accurately gauge inventory accuracy—with minimal disruption. Focusing on the most high-demand shipments will ensure that the most crucial items are being replenished. The process of cross-docking, while certainly a significant investment to set up, more than pays for itself in time and costs saved in larger distribution centers. With cross-docking, products can be loaded from one transportation container to another, completely bypassing warehousing and storage by sorting products in a staging area before re-loading items directly onto the next truck. This is used mostly with LTL shipments and is very effective for larger distribution centers that are strategically located for transferring shipments from one transportation route to another. Slotting your warehouse based on demand is an incredibly effective way to increase distribution center efficiency. As Tony Tyler tells Supply Chain Digest about the process: “Slotting choices should be performed dynamically rather than as a batch process…To do this, you need to place the picks by product in one or more ‘look ahead’ scheduled cycles or waves, usually to match the transportation schedule and transit times.” The technology to effectively implement this system can be cost-prohibitive for some warehouse operations, but partnering with a 3PL with Tier 1 technology can bring you these advantages and more. These are eleven basic warehouse and distribution center best practices that can help drive efficiency, however they are by no means the entire list. Every business has its own supply chain needs. Supply chain engineering experts who live and breathe warehouse and distribution center optimization, and build custom solutions for today’s businesses can make supply chain a competitive advantage. If you’d like to talk to one of our experienced supply chain engineers about your needs, please contact us.